Eating blueberries helps you lose belly fat? That's right! 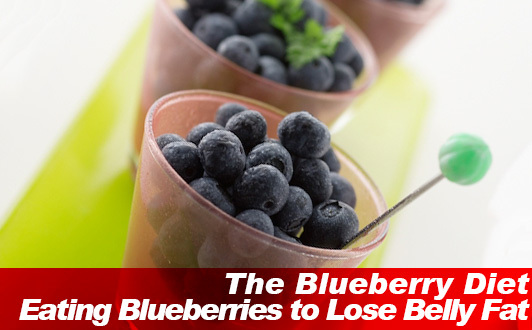 It doesn't matter if you are on a low or high fat diet, the blueberry diet helps you lose weight healthily. What is the blueberry diet? How much fruit should you be getting daily? Getting at least 2 cups of fruit a day is recommended for men and women between the ages 14 and 30. After 30, having only 1 and a half cups of fruit is recommended. However, this is only the bottom line on how m9uch fruit you should be getting daily. Like deciding what you wardrobe you are going to wear in the morning, figuring out what makes the best complement to you blueberry diet can be a daunting task to say the very list. What am I going to wear!? blueberry-banana yogurt smoothie you've been whipping up in the morning. Combining blueberries with other fruits (apples, oranges, grapes, etc.) like other food combining recipes takes advantage of the synergetic effect of combining fruits and vegetables with natural phytochemicals. For anyone who has ever experience a setback in diet and exercise whether that may be gaining weight back after trying so hard to lose weight in a short period of time or just not feeling motivated as you used to feel, running out of gas from not taking the breaks you need is the stone cold killer of all diets. There are all kinds of stuff that happens to your body when you are stressed. Failure to take breaks may cause stress buildup. Not only does stress affect you interpersonally, in the work place, and at home, it works its way into your diet and exercise routine like a virus. Taking the breaks you need whether that is from exercise or dieting (eating blueberries) is important for stable weight loss. Salvaging up enough willpower to make it between meals can be tough. For people that can make it, snacking is the only way to go. One of the healthy snacking tips that is not a bad idea to go by is that if it's between 100 and 200 calories, it is a snack that is not to heavy, not to light, just right. The amount calories in a bowl of blueberries is somewhere between 100-150 calories, which looks like a cereal bowl full of berries. Eating blueberries may help you lose belly fat, lower cholesterol, and improve glucose control providing benefits in terms of weight loss and your health. Studies show weight loss is not enough. With the number of people diagnosed with diabetes and metabolic syndrome on the rise, losing weight at the cost of health is not recommended. Blueberry antioxidants have been linked to the banishing of belly fat, heart disease, and diabetes. Not only do they change how glucose is stored and processed in the body, a diet rich in the antioxidant Anthocyanin has been shown to reduce the risk of heart disease and diabetes. Anthocyanin is an antioxidant also found in eggplants, an autumn seasonal food that is not recommended to feed to a daughter-in-law. Unlike eggplant blueberries don't come with the same bloating effect on your body. As it turns out there are many health benefits of anthocyanin that can also be found in Kuromame black soybeans such as: cancer prevention, antiaging, lowers chances of developing illnesses like arteriosclerosis. For people unable to buy fresh Kuromame or blueberriesbut would still like to get anthocyanin, drinking black soybean tea for anthocyanin is one way to get the benefits of anthocyanin despite the season. Studies show weight loss in lab rats on a blueberry diet despite being on a high fat diet. Blueberries act as a natural cholesterol blocker. How it works is that it reduces the production of HMG-CoA reductase, an enzyme produced by your liver to make cholesterol. It is the same approach used by toxic cholesterol lowering statin drugs. However, unlike statin drugs that can potentially damage your liver, blueberries have little burden on your liver. Blueberry polyphenols may help prevent diabetes and metabolic syndrome. A diet rich in blueberry polyphenols has been shown to help the body combat high blood sugar giving you insulin resistance that translates into glucose control. As much as 8.3 percent of the population of the United States is said to have diabetes. That's over 200 million children and adults in the US. Moreover, twice the amount (50 million people) are said to have metabolic syndrome, whether that be diagnosed or not. For people suffering from diabetes or metabolic syndrome, blueberry polyphenols may be just the trick to improve glucose control keeping your blood pressure from getting too high. We've seen it time and time again, the diet that rules them all. Since the beginning when to it would seem that the latest source of information regarding dieting and exercise was as you would expect Seen on TV. Although there is no specific scientific evidence that going on a blueberry diet is going to help you lose 10 pounds in 21 day. However, just as you would expect from any diet that is worth more than 20 dollars, diversifying the foods you eat provides the best balance and nutrition as well as giving you enough freedom to try new things. It is the nature of human being to keep trying new things. In dieting that means to keep yourself unplugged from the plan and start thinking on your feet. That is why in this blueberry diet the only directive to follow is to eat 2-3 bowls of blueberries a day. That's the only rule to the blueberry diet.